Jeffersonville's the place to be this Halloween Night. New this year: The Halloween Sidewalk Parade! Parade participants meet at 5:30pm at the South Silo (behind the Union Bank) off of Depot Street. Come in costume, bring your friends, your brothers & sisters (younger and older), and your parents. Everyone is welcome to join in marching along. Bring a noise maker, musical instrument, or a dance if you have one. The inaugural Halloween Parade will be captured thanks to photos courtesy of Meadowood Media. The parade route will start along Maple Street, turn left on Church Street, and then onto Main Street. 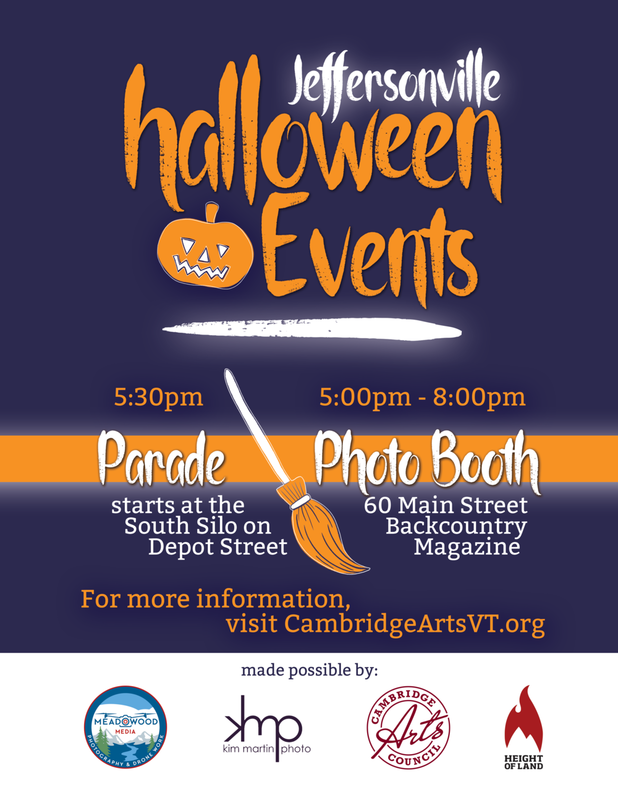 Speaking of Main Street....that's where you'll find the 7th Annual Halloween Photo Booth - the pillar of Halloween in Jeffersonville! Join us at Height of Land Publications (Backcountry Magazine) at 60 Main Street! Kim Martin Photography and Emoji Nightmare will be on hand to snap those spooky outfits. These are "must-dos" along your trick-or-treat trail!